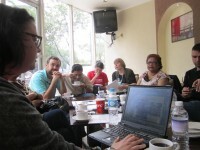 Mexico City A highlight of the year is always getting the reports of ACORN International affiliates around the world and hearing about the progress and the challenges members, leaders, and organizers are facing. The obstacles are legion, but so are some of the surprises. 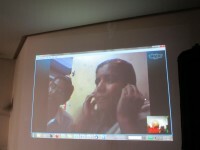 Vinod Shetty from Mumbai started the ball rolling with a clear Skype connection as he delighted everyone with the news that the ACORN India Dharavi Project band composed of some of our recyclers is being featured on MTV in coming weeks. He topped that off by reporting continued progress with the Blue Frog jazz club partnership and the album they are doing of acts visiting Dharavi with us that will be a fundraiser for ACORN India. Vinod also reported that we are running a school for our people now with 70 in attendance, which was a development I had not realized had gone so far. Later reports from Dharmendra Kumar in Delhi focused on the huge struggle around FDI (foreign direct investment) in retail that brought Parliament to a standstill in recent months, but Delhi also reported that they continue to run a homeless shelter for some of our displaced members. Bangalore reported on a full menu of action and activity! 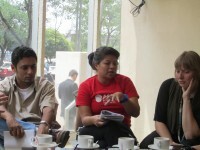 In Honduras Dilcia Zavala delighted people with the news that the land rights had been returned to the squatters the delegation had visited in the rain in Tegucigalpa and they were going to be able to rebuild their homes. Luis Martinez from San Pedro Sula gave a report that led all others in details on membership growth down to the fact that they have now knocked 10, 756 doors at some level in the several years of organizing! For the first time people really understood how groundbreaking the tenant-landlord campaign and model is that we are building in Rome. There was an education provided from Prague of the huge unrest around the current government that rivals the Velvet Revolution in 1989. Orfa Camacho had me showing a map of Peru when she announced new cities in Peru where we are now organizing and the ongoing development of our partnership with FENTAP, the water workers union. You get the picture? It was fantastic! Importantly the meeting also focused on developments with the Remittance Justice Campaign. ACORN Canada reported that a bill to cap the rates will be introduced in Toronto for the Ontario province on May 31st with British Columbia following later in the year. Honduras ACORN shared the news that they had a commitment for a bill to be introduced before the elections next February 2013 at the latest. Working with our intern from the Clinton School of Public Service there was optimism that we would lay the groundwork for progress in Mexico. Good work has been done with more to come! In an exclusive interview with The Daily Caller, Association of Community Organizations for Reform Now (ACORN) founder and Service Employees International Union organizer Wade Rathke acknowledged that the tea party movement has been more effective than Occupy Wall Street in influencing American politics. While watching ACORN implode in the United States, Rathke has thrived in his new role as community organizer to the world by remaking ACORN International, known as Community Organization International in the U.S., into a worldwide community organization with near-global reach and power. And former ACORN board members say Rathke’s remarkable global turnaround is proof that most observers completely missed ACORN’s bigger picture and its broader goals.